There is almost nothing that I love more than opening my mailbox to find a handwritten note. I take my correspondence seriously and love to write thank you notes. I think that a nice handwritten note is the very least that I can do in appreciation for a gift, sentiment or lovely experience. I carry a few note cards with me in my purse, just in case a moment arises and a card is in order. One of my dearest friends gave me the best advice, she said to buy cards anytime that you see one that you enjoy, whatever the occasion. As a result of taking her advice, I have accumulated a random mix of cards for every holiday or emotion. Here are examples of some very nice stationary sets that I enjoy. * Crane Stationary, Swoozies, Kate Spade, Kate Spade. This entry was posted on 9:25 PM and is filed under stationary , Thank you notes . You can follow any responses to this entry through the RSS 2.0 feed. You can leave a response, or trackback from your own site. Love your blog! There really is nothing better than opening your mailbox to a written letter on beautiful stationary! Which stationary is the one in the middle with the pink flowers? I would love to get that one! Beautiful idea, you cannot say thank you enough! 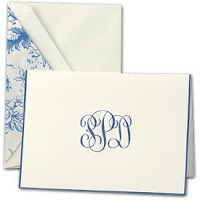 I always love a nice folded note with my monogram. For my wedding stationary (or is it stationery?) I had so many monogrammed Crane embossed folded notes that I have only just recently run out, and I got married in 1992! 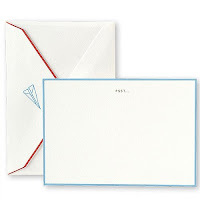 For Christmas last year, my MIL got me some lovely monogrammed note cards in white with the monogram in the most beautiful light blue. Perfection! Hi Chic Coles! 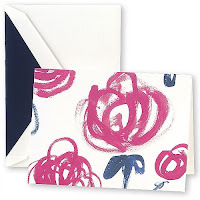 The floral brushstroke cards are from Kate Spade, aren't they whimsical and fabulous? Hi Southern Aspirations! Crushing the cards is certainly a big concerrn when carrying in the purse, good comment. My solution is to place the cards in a ziplock bag which then goes into my planner. If you haven't already guessed, I happen to carry a rather large purse! Thank you for getting back to me! I love those cards and am definitely going to get myself some! I love getting notes and writing them as well. We all need to keep up this lost art!